We’ve already covered the Train Fiasco of 2012, now let’s move on to the Backpack Fiasco of 2012. And to the story of how I came to hate DHL. This summer, in preparation for my Africa Adventure, I bought a trekking backpack. We were told not to bring suitcases as those wouldn’t work well in a truck (let alone on African roads), and since the only piece of luggage I owned was a giant suitcase, I jumped at the chance to get a backpack. After trying out quite a few different ones at our local outdoor shop, I chose the first one I’d tried on and that fit best. 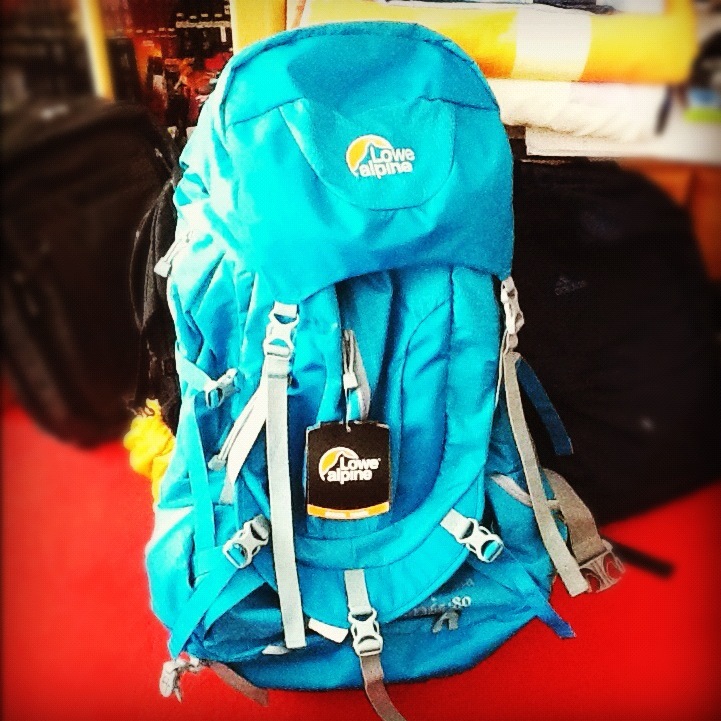 It was a LoweAlpine TFX Annapurna ND65:80. That means that it’s made specifically for women and has a volume of 65l (that can be extended to 80l). And, perhaps best of all, it was bright turquoise. And off I was to Africa. On my return from Ghana, I had a bit of an issue with my luggage, namely that it had been left by Lufthansa in Frankfurt because my layover time was so short they were afraid they’d be delayed and have to pay some kind of penalty if they transferred the luggage to the next plane… (Great service, isn’t it?) My father and I immediately went to the lost-and-found office where I had to fill out paperwork and was told where I could pick up my luggage the next day. It all worked, too, except once I got there a day later, one of the hip straps was missing. I assume it got caught in something during transit and was ripped off, effectively rendering the backpack useless because the entire point of having a backpack like this is that the weight is on your hips, not your shoulders. When we came up on the date I’d specified (a few days before my Italy trip), I called the workshop and asked how far they were. I was told that my backpack hadn’t even arrived yet. Imagine how baffled I was, because usually, that kind of stuff takes just two or three days rather than weeks. Cue me calling DHL several times (at 0.14€ a minute and being put on hold for minutes at a time). In the end, I was told that they didn’t know why the delivery had been held up (and right outside of Frankfurt, too), so they’d send out an enquiry to the place where it was currently stuck at. I resigned myself to having to take my gigantic suitcase to Italy, which was a huge annoyance. I had told DHL that I would be on holiday and they wouldn’t be able to reach me, but of course they didn’t write that down so they tried calling me in Italy… Idiots. Anyway, when I came back from Italy, the online tracking told me the backpack was still stuck near Frankfurt. At least I already had the paperwork to claim reimbursement in my mail box. So I filled that out, which included me having to sort through a whole bunch of old, dusty sales receipts until I found the one for the backpack. Fun! The paperwork wasn’t quite clear, though, so I had to call DHL again. That call was ridiculous, too, because when you call, you get this computer voice telling you to press ‘1’ for your delivery status, ‘3’ for national enquiries, and ‘5’ for international ones. I pressed ‘3’ because my delivery went from Berlin to Frankfurt. And unless it went via Timbuktu, it was most definitely a national delivery. I was put on hold for a bit—nothing too bad—and got through to a lady. I told her the entire story, and then she asked me if it was a national or international delivery. I said ‘national’, obviously, which was the number I’d pressed. Except, she told me that I was now speaking to international enquiries and she’d have to patch me through to national. Ridiculous. They do that just to make money. I was pretty angry at that point, especially once they put me on hold again for a while, much longer this time. Again just to make money. Anyway, one of the questions I had was for the form that you’re supposed to fill out where you put in what was in your package, a detailed description of each item, and how much it had cost. Since I’d ‘only’ lost one item, my question was about the ‘final sum’ because the form asked for the amount of money for each individual item, then the same amount minus the VAT, and then the final sum. It looked to me like they just wanted to have the final sum without the VAT, which obviously would be unfair because I paid the amount with VAT when I bought the backpack. So I asked about that and was told under no uncertain terms that yes, I would be getting the entire sum back. To this day, I haven’t heard anything back from DHL, and a conversation I had with my dad the other day made me even more suspicious. He said that a lot of car insurance companies do it the same way these days; that you, if you just get the money back, get it without VAT, but if you buy the same item that had broken, you’ll get the entire sum. There wasn’t even an option on any of the forms to decide what you wanted to do, though, so right now, I wouldn’t be surprised if they just gave me back ca. 160€ instead of the 200€ that I’d paid originally. For a nearly brand-new backpack. I will be so mad and will definitely lodge a formal complaint if I don’t get every single cent. I mean, that’s not even counting all the money I spent on the phone calls and letters and whatnot. I’m not leaving them a cent more than I have to. By this point, I’m fairly sure that somebody just took the backpack, somebody who works for DHL. I mean, it was nearly brand-new, and except for the one missing strap that is easily fixed, it was in great condition. Add to that the fact that (good) trekking backpacks are very expensive, and I’m not surprised somebody stole it, but definitely angry. One afternoon a few weeks after starting to type this up, I suddenly got a call from Lufthansa rather than DHL, and the guy on the phone told me they wanted to give me the money for the backpack. I emailed him my bank account information, and was given every single cent back. So thanks, Lufthansa, even if it took months and what feels like hours of phone conversations. I’m buying the same backpack again now, for the next big trip this summer. Let’s hope 2013 doesn’t have a major fiasco—2012 had two, that means 2013 owes me one, right? Right?